I present to you the sweet yet salty, kind-of-disgusting-if-you-think-about-it-too-hard, absolutely delicious delicacy known as spam musubi. This creation, deceptively minimal in design, requires its own special musubi molder. As we all know, any dish that requires special equipment must be exotic and/or gourmet. I’ve always found it kind of funny that spam musubi originates from Hawaii. When I think of Hawaii, I imagine the beautiful beaches, the volcanos, the plantations of sugar and pineapple, the abundance of sea life. 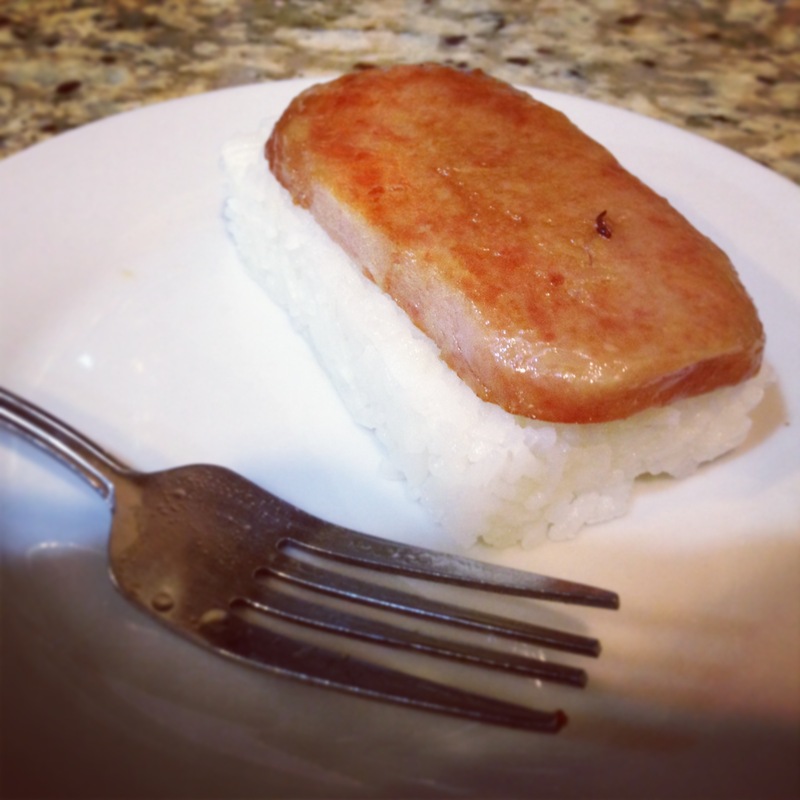 Enter spam musubi, a bastardization of sushi using canned meat. It combines two non-native, and yet pervasive aspects of Hawaiian culture: the large Japanese population, and the presence of the U.S. Pacific Fleet. The first Japanese to arrive in the late 1800s were survivors of a shipwreck, and subsequent Japanese arrived as laborers on sugar cane and pineapple plantations. Then in 1940, the U.S. Pacific Fleet moved from San Diego, CA, to Pearl Harbor, where they had an unfortunate run-in with the daring and desperate Imperial Japanese Navy. Though the day continues to “live in infamy,” the U.S. fleet remains garrisoned in Pearl Harbor. Spam was created in 1937 and fed troops and civilians in the US and in war-ravaged Europe. And despite the war and internment and all the general animosity between Japan and US, Spam then caught on with Asian cultures, becoming popular in China, Japan, and South Korea as a cheap accompaniment to rice. And somewhere along the way, some insane, brilliant person decided to take one of the fanciest forms of Japanese cuisine and combine it with a food created expressly for people with tight budgets. And so this unassuming, budget-friendly, exotic yet familiar snack actually represents a kind of beautiful conclusion to a story of mistrust and mistreatment, of war and reconciliation, and as an understated yet well-loved representation the alliance of security and friendship that has somehow arisen between two former adversaries. And to top it all off, it’s pretty darn tasty.